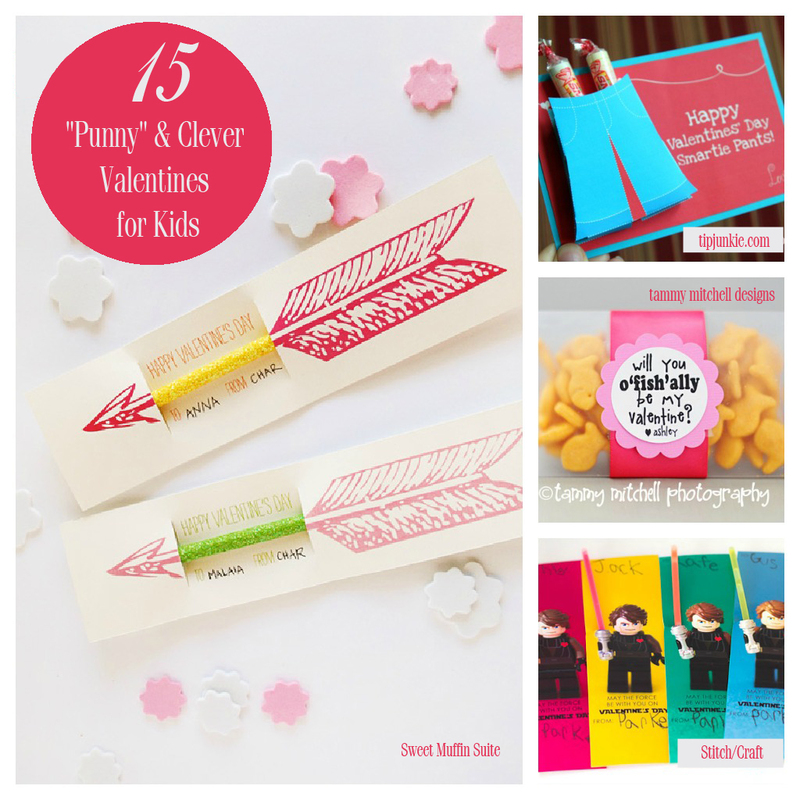 Are you looking for some creative and unique valentines for your kids to distribute this year? Store-bought valentines are okay in a pinch, but how about doing some DIY creations using a variety of items you can get in the dollar section of Target or your local dollar store? 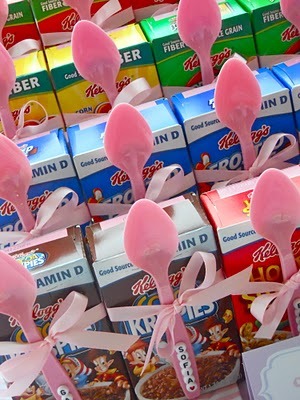 Or how about some clever things to do with the usual candy treats? Well, consider me your one-stop idea shop! I have 15 "punny" and clever ideas for you! (I, of course, located all these fabulous finds on Pinterest.) And almost every one provides a printable for you, either free or for purchase. Oh happy day! 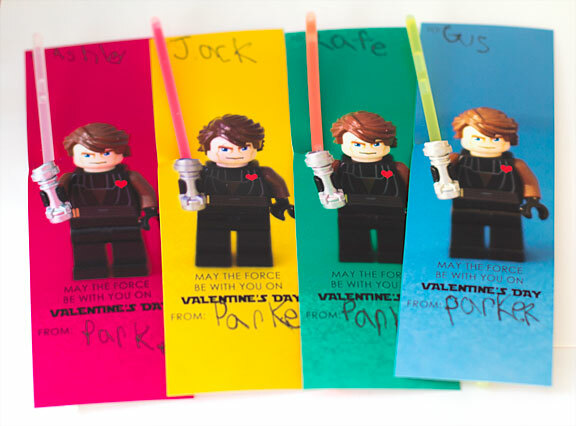 The boys actually used these "Forceful" valentines last year and they were a huge hit. I loved that they did not involve more candy and they were so perfect for my Star Wars-obsessed little men. Holly at Stitch/Craft even has links for you to download the pdf file (in color and black and white) for your own use. Thank you Holly! 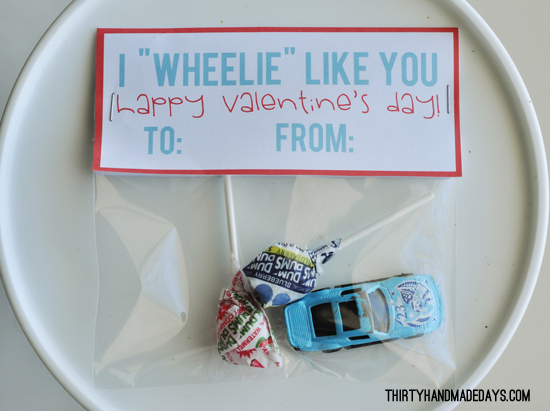 These car valentines are not just for the boys anymore! I know several girls from BOTH of my boys' classes who would love to get these valentines. And how fun for the boys to pick out their favorite cars at the store to include in them? Mique at Thirty Handmade Days provides the bag topper printables for free in her Freebies section. But I suggest that you don't just stop there. You absolutely MUST check out her other fabulous printables that include travel bingo, gift tags and quotes. 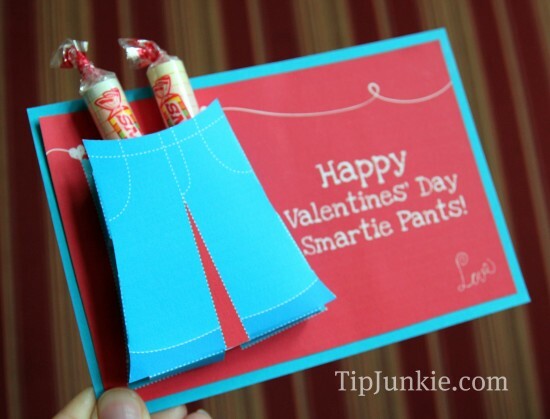 These Smartie Pants valentines are just a hoot and Laurie at Tip Junkie has an excellent tutorial on how to create these DIY valentines. There are 2 versions of it also, a 3D version, like pictured above, and a non-3D version if you don't want to do as much cutting. The printables are there for you to use and her instructions are great. They'll take a little time and patience, but oh, how fabulous! I spent a lot of time on Juliann's blog, Faboolous, after clicking on the above image from Pinterest. I just love her site and ideas and her style. So many great printables for holidays and helpful hints. You absolutely must visit her shop, PBJ and J on Etsy too - the items she has are just too cute for mere words. That is where you'll be able to purchase the adorable printable for the fishy valentines! 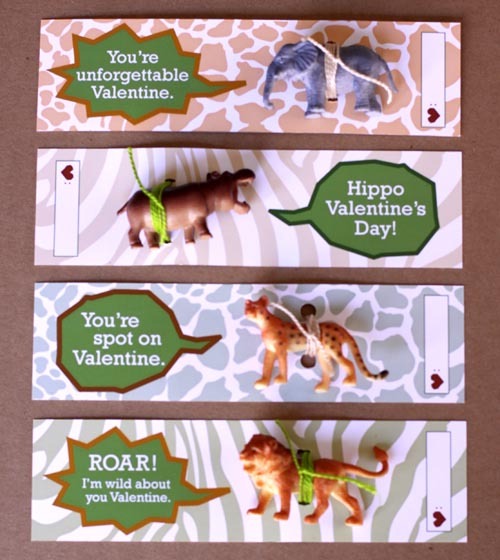 These bear-themed valentines found on Spoonful.com were ones that stuck out to me because they are simple, easy and perfect for the kids to do all on their own. 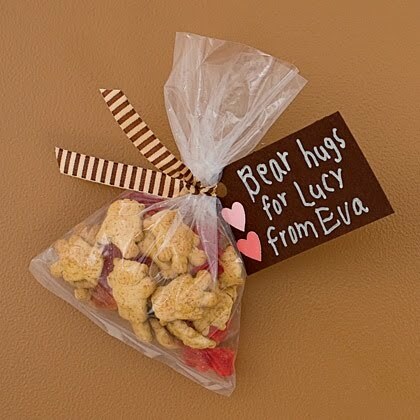 Just get a plastic baggie, fancy up a regular twist-tie with some cute washi tape and have the kids handwrite a tag adorned with heart stickers. It will keep the kids occupied and you'll get some time to catch up on dishes or check email while they're at it. Spponful.com has Valentine ideas of all varieties: games, printables, crafts, recipes...you name it, it's probably there. Not surprising since it's part of the Disney family of sites and products. I go to this site quite frequently for family and kid-friendly ideas to pass the time on vacation days, and to help me in planning classroom parties. Gabrielle at Design Mom posted these on her blog two years ago, but they are making their way around Pinterest again due to the upcoming holiday. Too cute and I love her play on words with each animal. You could pick up a box or bag of animals from the local dollar spot I'd imagine, but I think even Michael's carries a tube of animals that are not too pricey either. 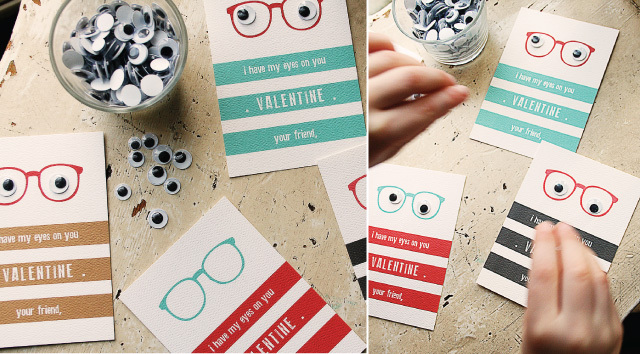 Gabrielle has a 4-page pdf available for you to download for free so you can make these adorable valentines yourself. Isn't she sweet? 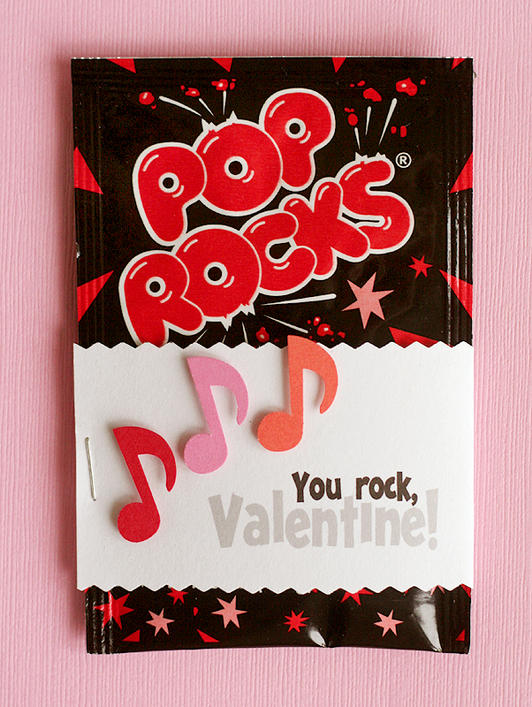 Some plastic bags with crayons, glitter, bubbles or band-aids are all you need to make these awesome valentines. Just print and cut out the bag toppers, yours free from Prudent Baby, fill the bag with your chosen item and voila! Easy-peasy, darling valentines. LOVE. And how about these cuties? Nat and Holly at My Sister's Suitcase have a blog that covers the gamut, but I must say I just love their printables, upcycling ideas and ideas for kids. These bubble valentines are super cute and would of course be nice with the liquid bubble mix as pictured, but you could even fill a bag with bubble gum balls or Double Bubble. It's a cute pun either way. 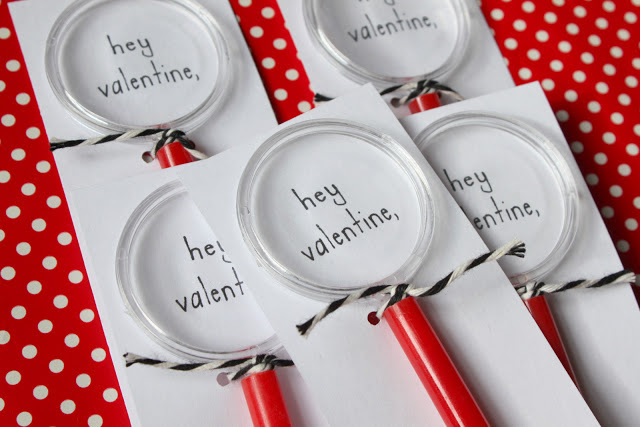 I love these magnifying glass valentines from Dandee Designs. Danyelle has the pdf file for you to download right there in the post, so be sure to click on the photo above to get yours, and she mentions that she got the magnifying glasses at her local party supply store. Too. Darn. Cute. Leana at A Small Snippet came up with these simple and sweet valentines that use one of my all-time favorite candies from when I was a young lass. 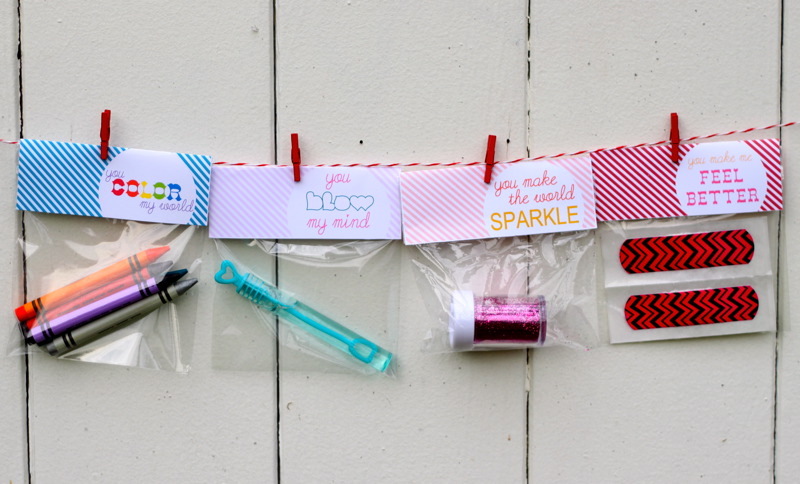 She even has the bag toppers on her site as a free printable. How can you go wrong? Well these are just too darn sweet. 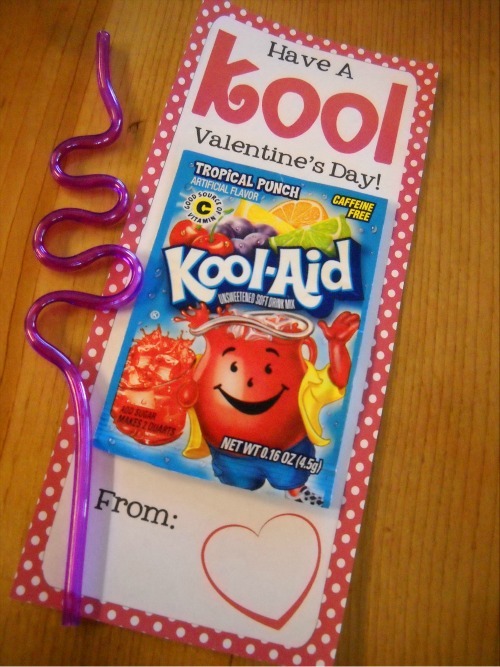 Paired with a silly straw, these Kool valentines are sure to be a favorite of all the kids this year. There's even a printable for ya! You know how I LOVE those! Glittered pencils, usually located in packs of 8 or 10 can be found in the dollar area at Target. 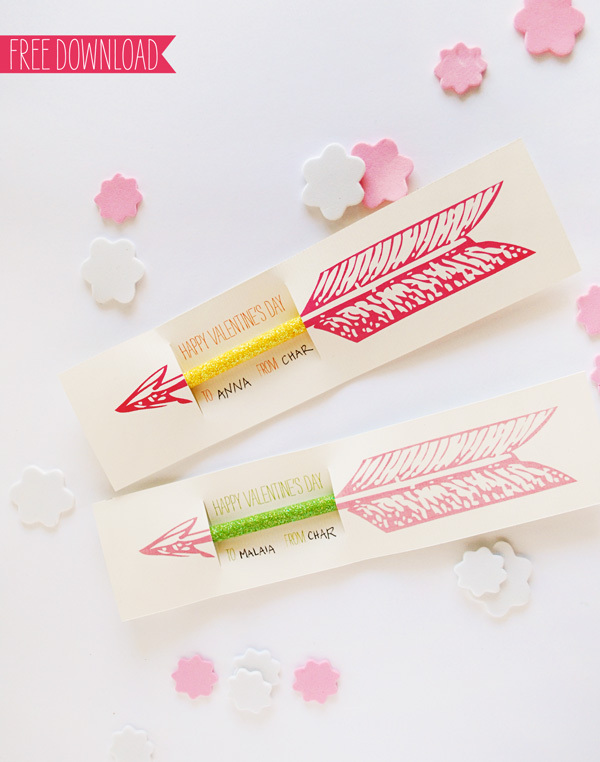 You could even use patterned pencils to make these adorable valentines. I don't know about you, but my boys are WAY into pencils and erasers so these may be the valentine of choice this year. Pauline Grayson, aka Muffin, even has the arrows on her site ready for you to download and use for free. Isn't she the greatest? Thanks Muffin! 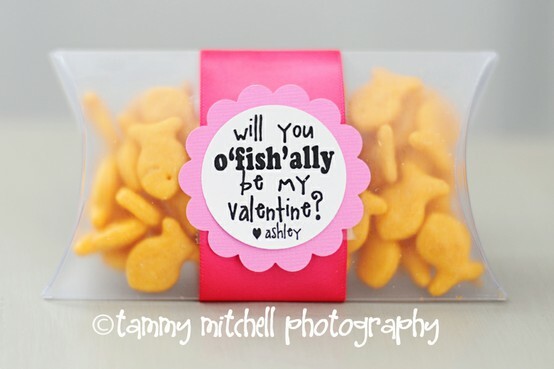 Will You "ofishally" Be Mine?" Well aren't these little pillow box valentines just adorable? You can get the pillow boxes in Tammy's shop and she has the tag printable available for download here. 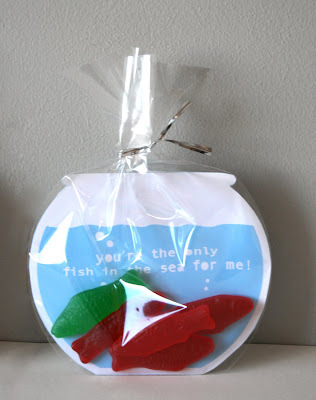 I love this take on the "fish" theme, and you could even mix and match it with the Swedish Fish valentine listed above! How fun is that? 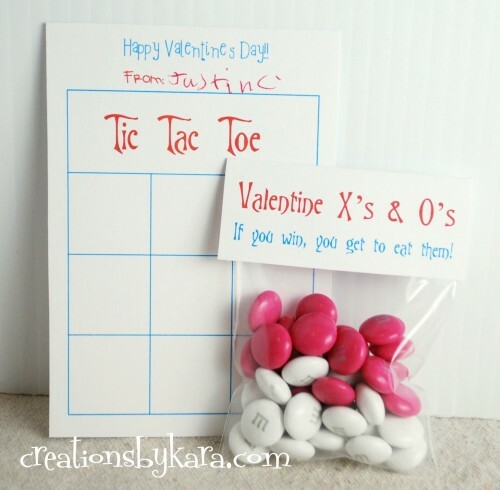 Used as place markers in this cute little printable Tic-Tac-Toe Game, any bite-sized candy will be a treat. Kara has the game board and bag toppers on her site for your use. I'd use a zipper plastic baggie to enclose the game board and the candies in one spot. 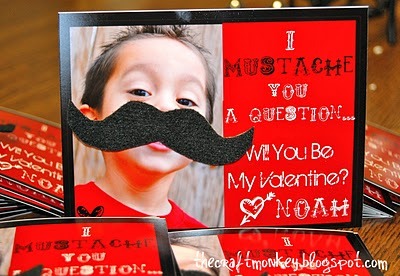 With the popularity of mustaches these days, how can I not include this adorable idea from Heidi at her Craft Monkey blog. (She got the idea from another great blog Tidbits from the Tremaynes.) I love that she has a picture of her handsome valentine distributor on the front and embellished with a felt mustache adhered with a glue dot. This valentine would be cute with a mustache on a stick photo prop, don't you think? Then the mustache could be removed by the recipient as a fun costume for the day! Hey...I might be on to something. I hope you've found some inspiration for your Valentine creations - and be sure to share YOUR creations when they're complete!